April 2019 marks one hundred years since designer and architect Walter Gropius founded what was, undoubtedly, the most influential school of fine and applied arts of the twentieth century, the Staatliches Bauhaus, more popularly known as the Bauhaus. Although the Bauhaus was relatively short-lived, its legacy is still felt through the radical, pared down, modernist aesthetics that were integral to the work produced by both its staff and students, particularly in the fields of art, architecture, graphic design, interior design, industrial design and typography. Although the designs produced by the staff and students of the school were highly modernist, and often experimental, the ethos that underpinned this design, drew heavily on the design idealism of the Arts & Crafts Movement, which believed that being surrounded by only ‘good design’ would immensely improve people’s lives, and that such design should be available to all. 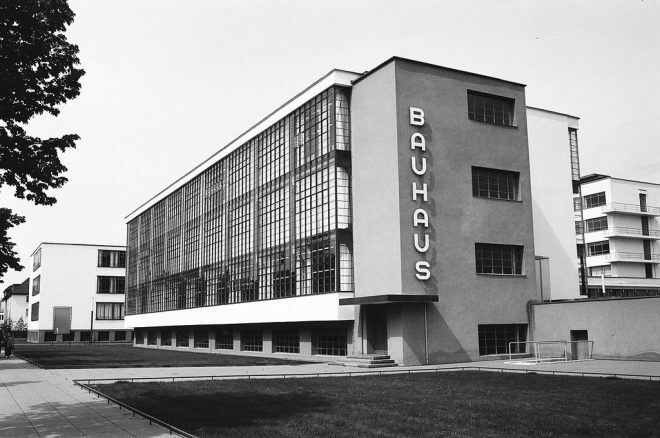 Although the Bauhaus was originally founded by Gropius in the city of Weimar in Germany, and, due to increasing right-wing hostility in that city, in 1925 it moved to a building designed by Gropius in the city of Dessau. The school then remained in Dessau until 1932, when it moved to Berlin. However, the rise to political power of the Nazi party, who condemned the school as a centre for ‘Communist intellectualism’, meant that the school was finally dissolved in 1933, and many of its staff and students fled Germany. Nonetheless, the ongoing legacy and resonance of the work produced can be seen in museums, and in homes, all over the world. 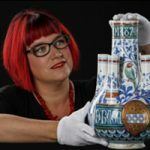 National Museums Scotland is fortunate enough to have three Bauhaus related items in the collections. 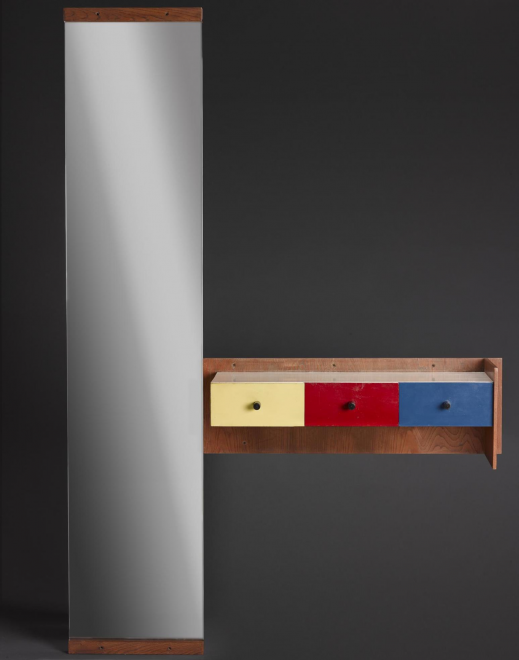 The first, and perhaps most striking of these objects is a 1925 dressing table designed by Marcel Breuer for one of the Master’s (or senior teacher’s) residential apartments at the Dessau school, which is currently on display in the Museum’s Design for Living gallery. All of the fittings of the 1925 building were designed within the school’s workshops, although the new building itself was designed in Gropius’s private architectural offices as the school did not have an architecture department until 1927. The bold, primary colours of red, blue, and yellow, and the simple geometric forms of the desk and mirror, undoubtedly show the influence of the paintings of Dutch artist Piet Mondrian on the applied art of the Bauhaus. It is thought that this particular example came from the apartment of the Russian artist and theorist Wassily Kandinsky and his second wife Nina Andreevskaya Kandinsky. The director of the Bauhaus from 1930, until its demise in 1933, was Ludwig Mies an der Rohe, generally known as ‘Mies’, who was appointed in 1930 when Gropius’s successor, Hannes Meyer, was dismissed by the mayor of Dessau for supposedly instilling communist views in the minds of the school’s students. Mies migrated to the USA in 1937 where he became one of the most influential architect-designers of the twentieth century. 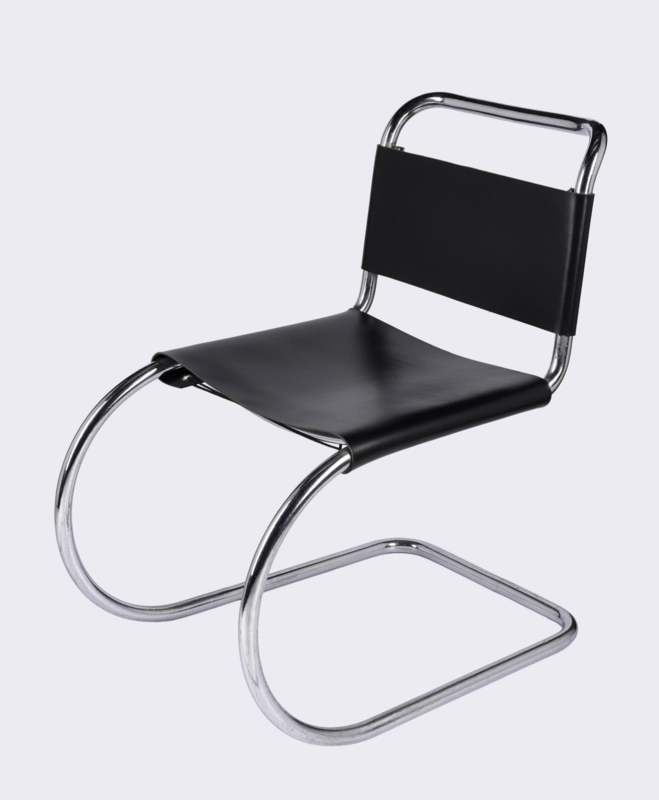 Also on display in Design for Living is a 1927 chromium-plated, tubular steel and leather chair, designed by Mies, and probably made by the famous German chair manufacturer Thonet. This particular chair was bought in 1930 by the British Surrealist artist Eileen Agar. In recent years, scholars of the Bauhaus and early Modernism have started to look more closely at the work of the women teachers and students of the Bauhaus who, for most of the twentieth century, have been frequently overlooked in favour of a focus on the histories of male designers. However, when the school was founded it was seen as highly progressive as it proclaimed gender equality and accepted both male and female students and had some women teaching staff, and in the first year of the school, it had more female than male students. However, initially, women were encouraged, particularly by Gropius, to work in what he considered more ‘feminine’ subjects such as ceramics and weaving, although this did change over the course of the 14 years that the school was in existence, the artist, sculptor, photographer and designer Marianne Brandt is particularly celebrated for her work in the field in industrial design . The final Bauhaus-related object in the museum’s collections can be found in the permanent gallery, Making and Creating. It is a 1968 tea set made by Danish manufacturer Rosenthal, the design of which has, habitually, been attributed to Walter Gropius by museums and other collections alike. 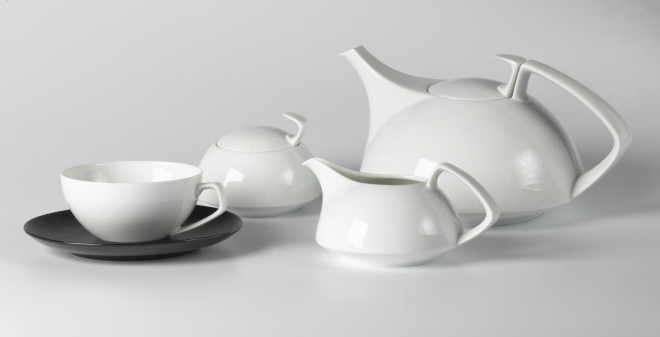 However, relatively recent research has shown that the design of the tea set was, in fact, a collaboration between Gropius and Louis McMillen (both for The Architects Collaborative, or TAC at the Harvard Graduate Centre) and also a young American woman designer called Katherine de Souza who was employed to transform the drawings of these two architects into ceramic reality. Recently, the 2018 Tate Modern exhibition of the work of the textile artist, printmaker and head of weaving at the Bauhaus, Anni Albers, achieved great critical and popular success and helped to cast light on work often obscured by the long shadow of her husband and fellow Bauhaus teacher, Josef Albers. The success of the Anni Albers exhibition is a testament to the enduring art, design and architecture of many of the incredibly talented women and men that emerged from the Bauhaus, and the important legacy of Modernist design, combined with Arts and Crafts ideals, that has lasted long after the school itself.